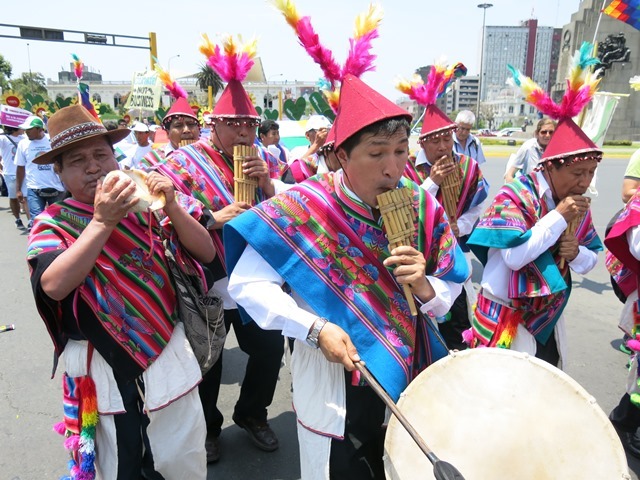 Yesterday, I joined an estimated 15,000 people who took to the streets of downtown Lima, Peru for the largest climate march ever in South America. This People's Climate March in Lima comes on the heels of the recent massive People's Climate March in New York. Citizens of the America's have united their voices. 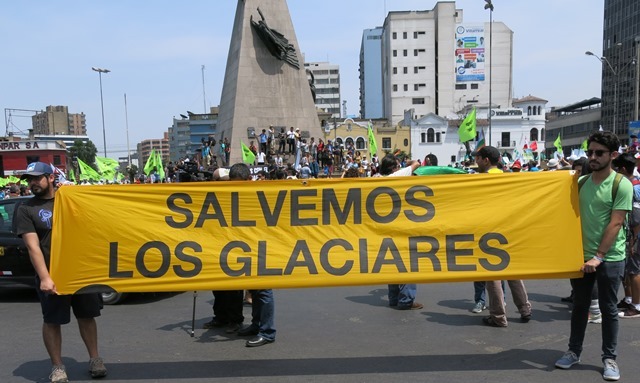 Governments and their negotiators gathered in Lima for the UN climate conference (COP 20) must produce a meaningful agreement that will save our planet from the devastating effects of climate disruption. Back at the official venue where negotiators haggled over the future of our planet, 100 local school children delivered a petition signed by 2.2 million people to UN Secretary General Ban Ki-moon, UNFCCC Executive Secretary Christiana Figueres, Peruvian President Ollanta Humala, and COP 20 President Manuel Pulgar Vidal. The petition calls on negotiators to forge a realistic global agreement "to rapidly shift our societies and economies to 100 percent clean energy by 2050." 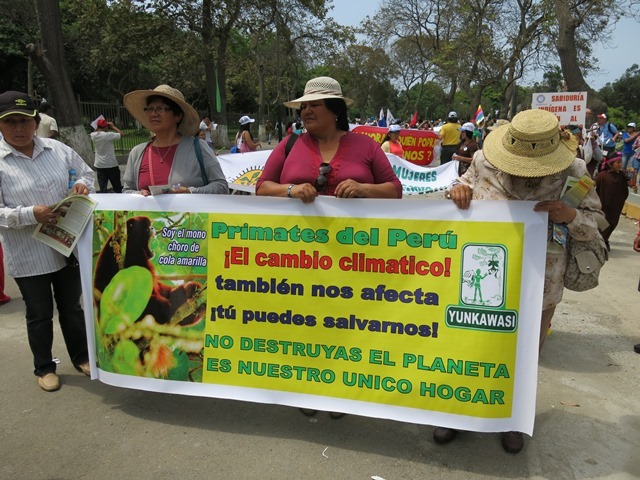 Under sweltering skies, the diverse congregation of marchers pled their case through song, dance, and banners. Drums, whistles, horns, and megaphones shouted for attention. Interests were varied in content but singular in purpose. Do not destroy the planet, it is our only home. 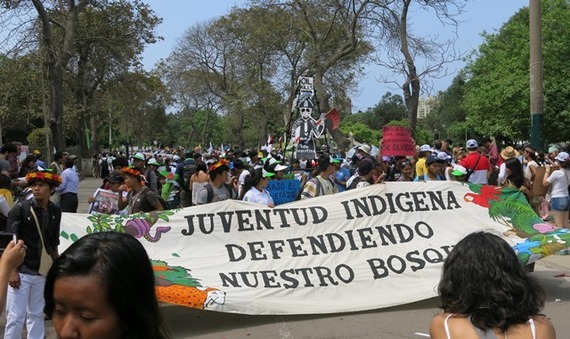 Indigenous youth call for defending our forests. Glaciers of the Andes, like glaciers around the world, are melting at an alarming rate. 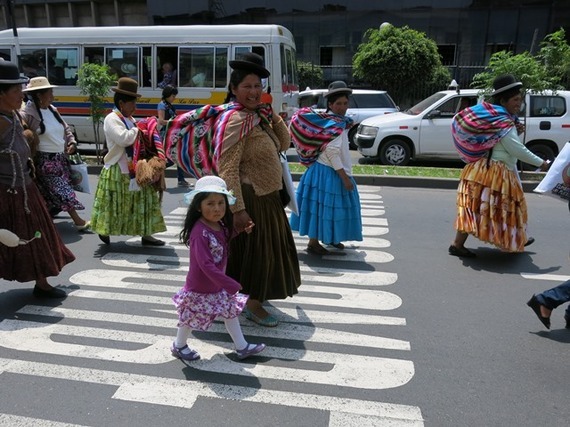 The message of "No" to REDD+ appeared to be in conflict with planetary needs. 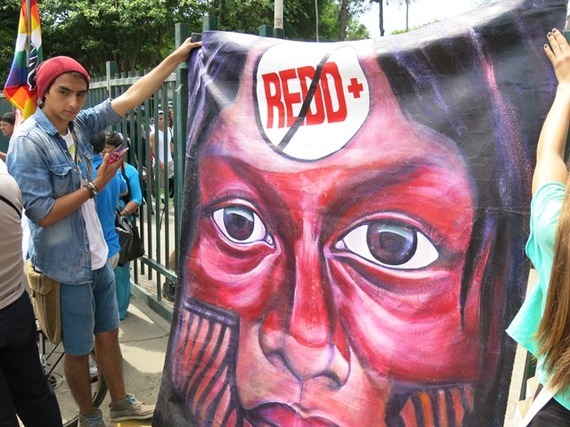 "REDD" refers to "Reducing Emissions from Deforestation and Forest Degradation" in developing countries. REDD+ is a powerful initiative which is gaining momentum within the UNFCCC process. At a high-level event at COP 20 on Monday, Helen Clark, administrator for the United Nations Development Programme and Chair of the United Nations Development Group, stated, "Deforestation accounts for 20 percent of global greenhouse gas emissions." But, indigenous peoples at the march offered me a counter view, "Financialization of nature is a false assumption. REDD+ asks us to reduce emissions and stop deforestation. However, pollution keeps happening in the northern countries. Our countries in the south are used as the lungs to absorb northern pollution." I would summarize their collective views by stating that 80 percent of pollution is from sources other than deforestation. They want to save their forests, but the major greenhouse gas emitters cannot buy-off their climate responsibility through minimal financial contributions to REDD+. I felt that this tee-shirt concisely summarized the marcher's message. 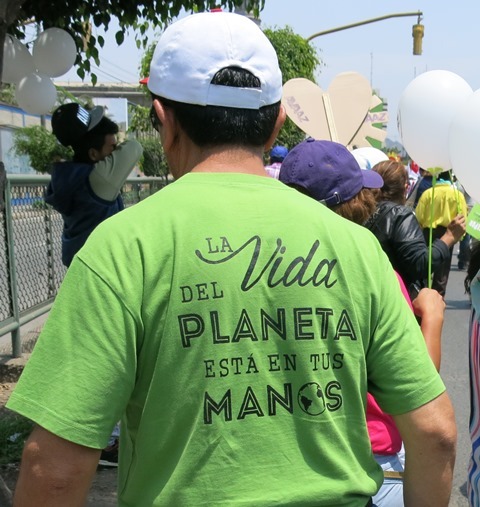 The life of the planet is in your hands.